Vor einiger Zeit habe ich mal eine Karte geteilt die ich seinerzeit in der FAZ gesehen habe. 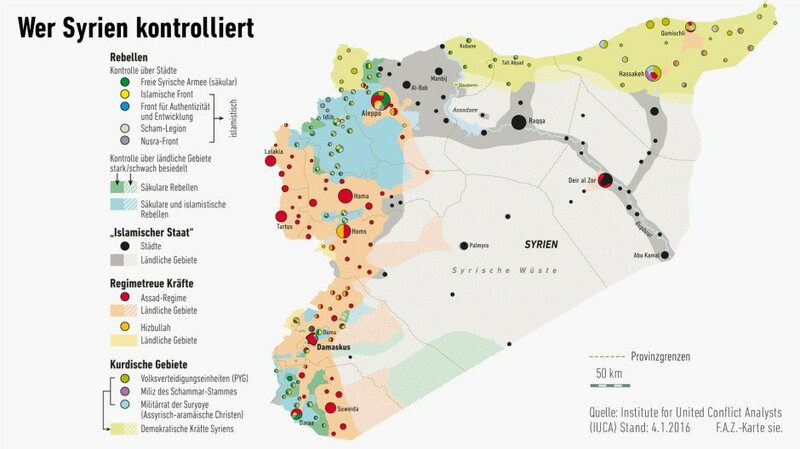 Sie hat mich beeindruckt, weil sie die scheinbar unlösbare Situation in Syrien auf einen Blick erkennbar macht. Und für Karten-Themen bin ich sowieso immer leicht zu begeistern. Ich habe mich, als den Post heute wieder zu Gesicht bekam, gefragt, woher die Informationen kommen und ob es wohl eine aktuelle Version gibt. Als Quelle ist ein gewisses “Institute for United Conflict Analysts” (IUCA) benannt, dessen verwaiste Twitter- und Facebook-Timeline nicht viel weiterhilft. 20 yr. freedom, democracy and nature activist. reporting on and mapping out Syria, Kurdistan, Libya, Iraq, Ukraine, Palestine, Somalia and the world’s wildlife. Thomas van Linge does not work for the U.S. State Department and he’s not a journalist. He’s a 19-year-old high school student in Amsterdam and he’s joining a growing movement of citizen cartographers mapping violence in the Middle East. It’s an endeavor few media outlets have replicated as consistently as van Linge and his cohorts, sites like archicivilians, and grassroots intelligence organizations such as the Institute for United Conflict Analysts. They do a good job filling in the pretty huge gaps left in the reporting of the conflicts,” says Higgins. “Something like mapping the conflict in Syria is hugely useful simply because there’s no real mainstream sources that produce those regular updates for public consumption. […] The continuous surveillance and visualization of geopolitics and civil war dynamics has increasingly moved away from news organizations and into the hands of people like Thomas van Linge, in part because media needs to choose its own battles, and can’t afford to have staff focused singularly on updating maps in real time. Eine gute und neutrale Grundlage also, die mit dieser Arbeit für andere gelegt wird. Sie dürfte sich somit in Nachrichten niederschlagen, die wir täglich konsumieren.